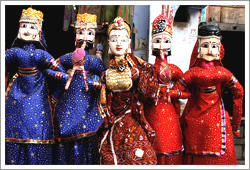 Rajasthan is famous all over the world for its exquisite handicrafts. Each region of the state has its own special handicraft which is made from locally gathered materials. The Rajasthani handicrafts are popular for their quality and are not very expensive. Tourists touring Rajasthan never go back empty handed. They buy several handicrafts to take back home as memories of Rajasthan. Even today the Rajasthani handicrafts maintain the beauty and quality of the the art and craft belonging to the era of the erstwhile Maharajas. The craftsmen of the state show great deal of creativity and highly developed skills in wood and ivory carvings, textiles with fast and bright colors, tie and dye and block prints on fabrics, silver jewelery/real stones studded jewelry, blue pottery, miniature paintings,marble statues and lacquer and filigree work. The Rajasthani wooden furniture is available in different shapes and designs. Some wooden furniture such as tables, chairs, stools etc are decorated with beautiful miniature paintings.Furniyure is available in the shapes of animals too.. They are meticulously carved into shapes of elephant, horse etc. Rosewood and sandalwood serve as the materials for carving the images of the deities. Many decorative articles are also made from wood. The colorful carpets and durries of Rajasthan come in various sizes and designs. The woolen carpet of Tonk, Bikaner and Jaipur are in demand. They are made in Persian style. They are also available in cotton fabric. Paintings of Rajasthan are one of the most famous art form. They are broadly classified into miniature and folk. Fine bright colors are used and several themes are painted on canvas. The composition draws attention. Such paintings are basically called Phad paintings. Rajasthani textiles displaying vibrant colors and designs are in great demand. Tie and dyed(called bandhani) and block printed textiles are liked by the tourists not only from India but from abroad as well. They look very lively and rich. The colors used in these fabrics are fast. Various patterns are used in the textiles but the lehariya, mothda, ekdali and shikari are the most famous ones. The fascinating blue pottery of Rajasthan is truly unique. Originated in Persia, the blue pottery is peculiar because of the raw material and colors used in it. It is made from ground quartz stone and only white, blue and green colors are used in it. Articles like surahi(pot), tiles, flower pots, ashtray, lamp shades, jars and other decorative items are a part of the blue pottery. Several household items and decorative pieces such as table tops, dancing peacocks, elephants, camels, swords, shields etc are carved out beautifully in metal. You must have heard about the fabulous Rajasthani embroidered Jooties(foot wear). They add royalty to the traditional attires of the people there. Jooties, bags, purses,hats etc are made from pure leather by the efficient cobblers of Rajasthan. Incredible statues, idols, chair, table and other decorative items are carved from the marble by the expert craftsmen of the state. Such carvings form an important part of the houses of the state. The handicrafts of Rajasthan speak oodles about the rich art and craft of the state.